These inspirational quotes were found in the October 7th issue of Women's Day Magazine. Like many parents, I pray this simple prayer with my children each morning as we begin our day. It's comforting to know that we have this supernatural beings around to help us and protect us as we go through life. Plus, I know that both my children and I need all the extra help we can get! Sometimes I think that my boys' guardian angels must be exhausted by the time that my children go to bed at night. Belief in guardian angels, therefore, has much to recommend it. I truly believe that there are angels that walk beside each one of us, however it is strange to try to picture my particular angel or those of my children. I wonder what their names are and what they look like. Who else have they watched over? I imagine that we actually get to meet our guardian angels once they deliver us safely to the other side of life. In the meantime, I ask for my angel's help each day and trust that he or she is looking out for me. I sometimes even ask my angel to wake me up at a certain time if I want to get up early. My angel has never failed. The Feast of the Guardian Angels is a good time to remember our guardian angels, especially if one hasn't given them much thought in a while. It is an opportunity to say 'thank you” to them for their faithful service, as well as to say “thank you” to God for providing them in the first place. God in His wisdom knew we could use the extra assistance! The Feast of the Guardian Angels is October 2nd. A parish is a religious education program - need to always be welcoming. Catechesis is everything a parish does. We have a responsibility as Church to share our faith. I am looking for more articles for my Spiritual Woman website. If you have written a book review or article that you would be willing to share and you feel would be appropriate to the site, please send it to me at pfmacarthur(at)comcast.net. I will, of course, provide a link to your website or blog. "The Faith of a Child"
The Faith of a Child is an interesting article by Ann Garrido in "America" Magazine on the Catechesis of the Good Shepherd, a method of teaching religion to children that uses Montessori-type materials and works on the assumption that "the child is someone who already has a deep relationship with God." In many ways, it is child-based learning, focusing on where the child is in his or her spiritual journey and what he or she wants to know. It makes use of hands-on materials so that the child can make the lesson his own. As someone who is involved with religious education at my parish as well as in teaching my own children, I can definitely see the value in this approach. Providing the information a child is ready for and is asking about is so important. Children come up with all sorts of questions about God and heaven and it is of vital importance that we provide the information that they need. By the same token, preaching to a child about a topic he has no interest in is often a losing battle. I think that there is a place for both traditional instruction in the faith and this more child-centered approach. For more information on the Catechesis of the Good Shepherd, please visit www.cgsusa.org . I would definitely be interested in reading some of the materials listed in their publications catalog. US Catholic has a very informative interview with the two major-party candidates for president at: The presidential candidates make their case for the Catholic vote. One of the most comforting things about reading lives of the saints is realizing just how different all these men and women were. Some lived their lives in cloisters and dedicated their lives to prayer. Others worked in the missionary fields or died as martyrs for the faith. Some were priests or religious sisters while others were married or single. Some lived their whole lives in holiness. Others were great sinners and had a profound moment of conversion. There is no one-size-fits-all path to sanctity. While the basics are the same – love God and neighbor, there are as many different ways of fulfilling those commandments as there are people in the world. It is so easy as we go through life to look at others and think that their lives are much more “perfect” than our own. “Perfect” is not used here in secular terms, as in “She has the perfect house, car, husband, etc.” No, here, “perfect” refers to a much less-tangible quality: the inner peace and holiness and spiritual wisdom that we seek. We look at others and think that they have found the “right” path. If we just imitate them then we, too, will be on the road to perfection. Certainly, much can be learned from studying the lives of the saints. We could do far worse than to imitate some of their behaviors and attitudes. The same can be said for those we meet in our daily lives who inspire us. Yet, imitation will only get us so far. We can't walk the same path as our favorite saint or our best friend because God gave us different gifts and different circumstances. Our task is to pray and discern where our gifts can best be put to use to help build the kingdom. What is God asking of me today? How can I best show love? These are the simple questions with the not-so-simple answers that each one of us must consider on a daily basis if only because the answers change as our lives change. What God is asking today is different from what God asked five years ago or what God will ask five years from now. All we can do is humbly offer our lives to God and attempt to do His will wherever we find ourselves today. I find this thought very consoling. Lately, I have been feeling very inadequate, comparing my own life to others and seemingly coming up short. This isn't hard to do when surrounded by amazing people. I'm blessed to have such wonderful people in my life and I struggle to keep up. It always seems like there is more that I could be doing. I know I am far from perfect and that I have far to go on my own road to sanctity, but I'm trying. In reflecting on this desire I have to be like others, I have come to realize that God is not calling me to be them. He is calling me to be the best me that I can be in the circumstances I find myself, no more and no less. I wasn't called to serve in the Peace Corps, or to travel the country giving lectures, or to be the mother of ten children. At least for the moment, I have been called to serve my local parish community, write articles, be the best wife I can be to my husband and the best mother I can be to my two boys. I was reminded of St. Therese's image of the different flowers in the garden. What good does it do for a daisy to want to be a rose or vice versa? We each have our own beauty to bring to the world. God calls each of us to our own path to perfection. It is our job to walk the path, one step and one day at a time. Long-time readers of my blog know that my older son has struggled with spelling since his very first set of spelling words back in Kindergarten. We just found an on-line resource that is helping with the battle: Spelling City. With Spelling City, you can put in your list of spelling words and then play all sorts of games using those words and helping to reinforce the spelling. You can also take tests on the words. It really is a great site! Genevieve S. Kineke wrote a very interesting article on The End of Feminism" today for Catholic Exchange. As someone who grew up in the 80s and 90s, the question of what it means to be a woman has always weighed heavily on me. I grew up with the conflicting ideals of being told I could do anything I wanted to, while at the same time having the role model of a stay-at-home mother in my own mother. I was always raised to believe that if I had children, it was my responsibility to raise them. In college, I was viewed as anti-woman and anti-feminist because I wanted to stay home and bring up my children. I always knew I wanted to do something career-wise as well, but I wanted it to be something I could do when the kids were in school or part-time. I didn't have it all figured out when I was in college. Honestly, I don't have it all figured out now. What does it mean to be a successful woman or a successful mother? That's a question I think I will always struggle with. The answer just isn't that easy. Kineke makes an interesting point, however, that feminists (the ones associated with the National Organization for Women) aren't so much for women as they are against men, in particular, fathers. They are willing to acknowledge motherhood as being OK as long as it doesn't come within the traditional 2-parent family. Lesbian motherhood, sperm-bank motherhood, single motherhood - all these are OK. It is formally connecting your life with a man the way God intended that is looked at with scorn. We do owe much to feminists - the ones who fought for a woman's right to vote and a woman's right to own property in her own name, and to obtain an education. Somewhere along the line, the push for equality went way off track, however. Instead of seeking equality with men, the movement started seeking sameness with men, and in many cases, superiority over men. Men began to be seen as evil in and of themselves. Now, many women are working to stem the tide and reclaim the relationship God intended for men and women. I hope that we will be successful. The boys went on a field trip to the Big E (a big New England State Fair) today with Grandma, leaving yours truly to see how much she could accomplish in their absence. I did get quite a bit done, although of course not as much as I had hoped. One of the projects I have had on my to-do list for months is to convert my Spiritual Woman site over to Wordpress so that it would be on a content management system. I just don't have the time to create the html pages like I used to. I'm hoping that this will help me put up pages more frequently and make the site more of a resource. So, I spent much of today working on that. As anyone who has worked with wordpress.org can attest, simply choosing a template is quite a project. There is no guarantee I will keep the one I have up! Ursula King, professor emerita of theology and religious studies at the University of Bristol, is to be commended for tackling such a far-reaching topic as spirituality from a global perspective. In the introduction to "The Search for Spirituality: Our Global Quest for a Spiritual Life," King acknowledges that this book is intended as a "modest introduction to very large, complex realities and experiences." King attempts to define spirituality by what it does as opposed to what it is. Spirituality is a "lived experience . . .which seeks the fullness of life - a life of justice and peace, of integrating body, mind, and soul, a life that touches the hem of the spirit in the midst of all our struggles of living in a world that has become even more globally interdependent, yet is so painfully torn apart." King explores spirituality in light of several factors that influence one's experience of the world. Among these are religious traditions, life stages, education and health, gender, and ecological concerns. For each of these, she offers a brief overview of the historical contributions to understanding spirituality from these various perspectives, and then proceeds to describe and investigate the state of understanding today. There is also a discussion of the challenges that remain. 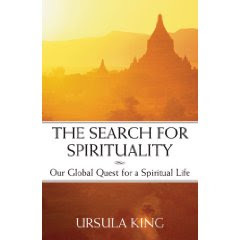 King succeeds in her mission to offer an introduction to global spirituality. The "Search for Spirituality" offers more questions than answers and should be used as a jumping-off point for further discovery and discussion. To assist in that end, King has provided a lengthy resource list which is very helpful. Here are two more resources for those interested in learning more about the Bible. 12 Strong Women of God: Biblical Models for Today and The Jesus Women by Marci Alborghetti are very useful for Bible study groups or individuals who want to delve into the women whose stories are told in the Bible. The stories she tells help prompt readers to explore their own faith stories and role in the Church community. Presuming that one already has $20,000 set aside, you would need to save $818.15/month for the 18 years before that student begins college (so basically, from the time a child is born). I honestly have no idea how my children will attend college. Unless they get scholarships, I am encouraging them to go to community college. It is sad to have to limit their dreams like that, but having experienced first-hand a crushing amount of student loan debt ($130,000), I can't encourage them to mortgage their entire future in order to obtain a college education. My husband got through undergrad and law school for that amount of money and I am thankful for the income that his job provides. The reality is, however, that even paying $800/month, we will most likely never pay off that debt. Today, that same debt would barely cover the cost of four years of undergrad at many institutions. How is anyone expected to afford that? the drawing, which will take place on September 25.
your post appears) has the EMN button. please). Please include your name (handles OK), blog name and URL (e.g. "http://extraordinarymomsnetwork.wordpress.com), post name and post URL. * EMN retains non-exclusive rights to all entries. * Questions? Write to hsaxton@christianword.com. Sunday, September 21, 2008 is Catechetical Sunday. On that day, those involved in passing on the Catholic faith through religious education programs will be formally commissioned for their ministry. The theme for this year is “The Word of God in the Life and Mission of the Church.” Catechesis is not just for children or those involved in the Rite of Christian Initiation for Adults (RCIA). All of us are called to a lifetime of continuing education. There is always more to learn about our faith and how to best live out that faith. This year, the Bishops are inviting us to take a closer look at the role of the Bible in our lives. The Bible can often seem intimidating and foreign. Unlike many of our Protestant brothers and sisters, we Catholics are much less likely to grow up memorizing scripture passages. We certainly are familiar with the Bible through the readings at mass and through learning Bible stories, but we don't tend to spend as much time with the Good Book itself. The Bible isn't as much of a friend as it could be. How should one begin to delve into the treasures that are contained in Holy Scripture? It is possible, of course, to start with the Book of Genesis and read straight through. The Book of Leviticus (book three going in order), which focuses on all the Jewish laws, often causes many to surrender this method, however. Every word of God is important, of course, but some books are more central to the on-going story of salvation history than others. If you are going to go with a start to finish approach, The Bible Made Easy: A Book-by-book Introduction by Fr. Timothy P. Schehr suggests tackling the following 14 books first: Genesis, Exodus, Numbers, Joshua, Judges, Samuel 1 and 2, Kings 1 and 2, Ezra and Nehemiah, 1 Maccabees, the Gospel of Luke, and the Acts of the Apostles. For those who truly wish to study the Bible, many parishes offer formal Bible study groups. If your parish doesn't, consider calling around to other parishes in your area to see what is available, or perhaps offer to start one. The “Collegeville Bible Commentaries” published by Liturgical Press are often used in Bible study groups. Dr. Scott Hahn and his wife Kimberly have founded “The St. Paul Center for Biblical Theology.” On their website, www.salvationhistory.com, there are many Bible study courses offered that are free of charge and can be completed at one's own pace in the comfort of one's home. Another popular method of incorporating scripture into one's life is to concentrate on the lectionary readings for the day. The advantage of this method is that the readings often focus on a central theme. They are available on-line at http://www.usccb.org/nab/". There is also a Daily Mass Readings podcast available at that same site. There are many guides that offer reflections to accompany the readings and to help apply the scripture of the day to daily life. Two popular guides are “The Word Among Us” (http://wau.org/) and “Living Faith” (http://www.livingfaith.com). Yet another way of approaching scripture is to randomly open the Bible and see where the Spirit leads you. While this approach is not as formal nor as recommended at the others, it can often provide strength when you need it most. Whatever approach one chooses, the important thing is to answer the invitation to integrate the Word of God more into one's life. God is waiting to talk to us through his gift of Holy Scripture. Will you answer the call? As part of our homeschooling preparation, we joined the Homeschool Legal Defense Association (HSLDA). While we certainly don't plan on having run-ins with the law over our decision and/or ability to homeschool, it is always good to be covered. I'm discovering that this decision has benefits far beyond an insurance policy, however. Today, I received a newsletter from them about "Homeschooling a Struggling Learner". It particularly focused on struggles with writing which both my children, but especially the elder, seem to experience. They are both bright children who hate to write. This newsletter really helped me to see that it may very well be a brain issue. The very act of writing takes them so much effort that the purpose of writing as a learning tool is actually negated. They don't learn anything by writing it down (ex. copying spelling words) other than the frustration of writing. Most of the suggestions in the article are ones that I have already incorporated - limiting the writing, doing more orally, and limiting the use of workbooks. Still, it is good to have validation that I am on the right path. It said to save writing energy for where it matters - actually learning how to compose a paragraph or paper. That is a thin pencil. That is a yellow and thin pencil. We were working from a Writing Strands book. The focus was trying to get children to use adjectives in their writing to describe something. He liked that once he had the first sentence, he was only adding a little bit each time and could copy the rest. It seemed to really relieve a lot of his anxiety over writing the subsequent sentences because he could copy them. St. Clare of Assisi has long lived in the shadow of her counterpart, St. Francis. Her life and thought have often been interpreted only through the lens of her close relationship with Francis. In recent years, however, the study of Clare has begun to come into its own. Clare was indeed an intelligent and radical woman in her own right who has much to teach us about our relationship with God and others. 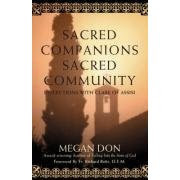 "Sacred Companions, Sacred Community: Reflections with Clare of Assisi" by Megan Don is not so much a study of her life or mission as it is a reflection on some of her thought. Don's focus is largely on how Clare can help us integrate the sacred into our relationships with others. Don designed this book to be used by individuals, small groups, or larger community groups. Meditations on each theme are offered for each constituency. Each reflection is brief and focuses on a different aspect of Clare's teaching or example. The reflections are loosely grouped in five sections, one for each of the five senses through which we come to know and experience other people. A final section concentrated on the mystical union that can occur when all the senses are engaged and focused on both God and the other. St. Clare, through Don's interpretation and reflection, offers a very earthly spirituality. It is firmly grounded in the experience of people as embodied individuals. Clare and Don also emphasize the importance of keeping love: love of God, love of the other, and love of ourselves, at the forefront of all of our relationships. That is an important lesson for all of us. It was the fall of 1984 and there was an election going on. Ronald Reagan and George H.W. Bush were running for re-election against Walter Mondale and Geraldine Ferraro. In my 5th grade class, we were holding a mock debate. I was George Bush! To prepare for the debate, we had to investigate our person's positions on a number of issues. One of them was abortion. Even though abortion had been legal for my entire life, I had never heard of it. I had to ask my parents what it was. They told me, but they weren't happy about it. Perhaps they felt I was too young to learn about such things. Perhaps they were trying to protect me, but I still remember that day when I learned that some babies are killed when they are still in their mother's wombs. It can be difficult to talk to children about abortion. After all, it is only natural to want to protect our children from the cruelties in our world. However, this past summer, I had that conversation with my two boys, ages 7 and 5. I don't remember how the topic came up, but I know that it was in reference to our current election season. I was explaining the different positions our current presidential candidates hold regarding abortion, and why we are supporting a particular candidate. They found it hard to get their minds around the idea at first. “Why would a mother want to kill her baby?” they asked. I told them that some mothers are very scared and don't think that they can be a good mother. I told them that they don't realize that God will help them. I told them that it is a very sad thing. They understood. The conversation has had a lasting impact. They still bring it up from time to time, usually when they see something on television about the upcoming election. There are two wonderful children's books that can help children understand the importance of valuing life in the womb. The first is Angel in the Waters by Regina Doman which shows a baby growing in utero with his guardian angel right beside him. It is a great introduction to how a baby develops over the course of the nine months as well as how special that time is. You can read the story at www.angelinthewaters.com. The second book is Justice Loves Babies written by twins Darlene and Danielle Wibeto. A video of the story can be found on “YouTube” (http://www.youtube.com/watch?v=zFjiCn7pd_A). Justice is a little boy whose mother is having a baby girl named Destiny. His father is an obstetrician. Justice is so excited about the upcoming birth of his sister. One night, however, he has a bad dream in which a doctor, dressed like his daddy, is trying to steal the baby from his mother's belly. He wakes up and begs his mother not to let anything happen to his sister. She tells him that she would never let anything bad happen to Destiny, but that not all babies are so lucky. Not all babies have the chance to live. She encourages Justice to pray for the babies, that all may have the opportunity to live. The Wibetos are hoping that more and more children will pray for babies. There is no question that abortion is a difficult topic to discuss with children, but “Angel in the Waters” and “Justice Loves Babies” can help open the door to having that conversation on an age-appropriate level. It may even encourage them to pray for the babies, and hopefully bring an end to abortion that much sooner. I saw my Director of Religious Education today after mass and told her I was surprised to see that I was teaching 3rd grade but that I was willing to try. She was all apologetic about putting me in that position and as it turns out, the person who had been teaching 3rd grade last year really wanted that year again, so I am going to be helping her out (a role I can fill quite nicely) and the teenager who was going to help me out will be helping out another class. So, everyone was happy and the whole thing worked out well. It was 1995 and the start of my senior year of college. Elms College was beginning a huge strategic planning project and was looking for students to take part. I was assigned to the Mission/Identity subcommittee. As I sat in the President's Office among faculty and staff and the president of the college, I was beyond intimidated. That feeling only increased when I was told our task was to research and make a recommendation to the Board of Trustees as to whether the school, which had been traditionally for women only, should go co-ed. Enrollment was down and some hard decisions needed to be made. I didn't go to Elms because it was a women's college - I went in spite of it. My parents gave me a great deal of freedom in my college choice - it was there or nowhere. It was Catholic and I could commute. Despite my reluctance to attend, I had a good scholarship to go and I did receive a good education. Needless to say, I was not wedded to the value of a women's college but I knew that many students were and I took my responsibility as a student voice on that committee seriously. The strange thing was that even though Elms was technically a women's college, we had men on campus. They had been accepted for years through the Continuing Education and Graduate Programs. Once in continuing education, they could change their status and become a full-time student. The college had a handful of these students attending during the mid-1990s. One particularly status-quo challenging man was in my year. He ran for vice-president of our class our junior year. He even tried to be a resident advisor for the all-women dorm! I knew him only by sight, but my friends and I referred to him as "the predator." I mean, really, what was wrong with this man? But his dogged persistence to give men a voice on campus contributed to the discussion of going co-ed. After all, what would happen if he sued for discrimination (which was a real possibility). First day of senior year, I discovered that he and I were in back to back classes together. "Dear God," I prayed, "What did I do to deserve this?" He and I sparred over almost every topic, but he was fun to have in class. We started dating in December of that year, got engaged in March of '96 and were married in July of '97. Yes, God does have a sense of humor! I married the "predator" in the Elms College chapel. Anyway, back to the committee, we did our due diligence, met countless times , and studied multiple reports. We came to the conclusion that co-education would be good for Elms College. After much further discussion and protests, The Board of Trustees voted to go co-ed in the Fall of 1997. I got to be there for that historic day because by then, I was working in the Continuing Education Office (I would work at Elms until 2002). During my time at Elms as an employee, I would get to see more and more men come and the college become a much more vibrant institution. Today Elms is more successful than ever, enrollment is up and the future looks bright. There is a large article in my local paper today about Elms College 10 years later. One of its major focuses is a couple that met and married at Elms after the school went co-ed. I know, however, that my husband and I, both in our own ways, helped make their meeting possible. We both played a small part in ensuring Elms College's future. Elms College Ten Years Later (It will only be available for the next two weeks). This is such a powerful verse! It reminds me that no matter what I might want to accomplish, no matter what plans I lay out, no matter how hard I work to achieve something, if it is not the Lord’s plan, it is all for naught. Humbly, I try to keep this perspective alive in my mind. It draws my attention to the fact that I serve God, not myself. It’s not my agenda that matters. To know that we labor to build by the Lord’s design helps us when that pesky temptation—pride—rears its ugly head. Remember: Pride is one of the most troubling roadblocks to holiness in existence. It often thrives in secret and can be very deceiving. To find out if you are laboring in vain or practicing any self-deception, ask yourself this one question: What is the purpose of my work? I found out today that I am going to be teaching 3rd grade CCD this year. I had to sign the boys up for CCD this year because David is making his first communion and we are homeschooling. We are doing religion at home, but I figure it doesn't hurt to have the reinforcement, plus it is another way for them to be with other kids. So, I offered to help, as I had done two years in the past. The emphasis is on help. I was an assistant. I passed papers, got supplies, helped with crafts. These are things I can do. I can teach adults and work with children on a one-on-one basis. Me in front of a classroom of children is a disaster. I know because every time I have tried this it has been a complete disaster. I thought I had adequately conveyed this to my Director of Religious Education, but apparently there must have been a lack of volunteers because now I am in charge of this 3rd grade class and I have a fifteen year old helper (no doubt she could probably teach it better than I can!). Well, I figure God must want me there for a reason - more lessons in humility perhaps? I will pray and do my best and that is the most I can do. CCD starts September 21st! I was so excited to get in the September issue of "St. Anthony Messenger" and see one of my favorite fiction writers on the front cover! Jennifer Chiaverini writes the "Elm Creek Quilts" series, books I love not only because they are great stories, but also because they feature quilts and quilting which I enjoy. I never knew Chiaverini was Catholic, but as it turns out she was educated in Catholic schools and is currently a parishioner of St. Bernard's in Middleton, Wisconsin. In Jennifer Chiaverini: Elm Creek Quilts Catholic Novelist, she talks about life as a best-selling author and how her faith is a big part of that life. Family is very important to her as well. 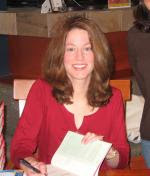 She is a mom of two boys, ages 8 and 5, and travels to book signings with her mother. After reading this article, I am even more excited about her works and happy to promote yet another Catholic novelist. You can find out more about Chiaverini on her website at www.elmcreek.net. Today was the first day of school in the city where I live. I wasn't sure how I would feel today when all the children around us started school and mine didn't, but as David slept until 7:30 am this morning (a rare thing! ), I breathed a sigh of relief. One of the worse things about sending the boys to school was dragging them out of bed in the morning. The same children who woke up with glee at 6:15 on weekends would not budge at 6:30 on school days. There were protests and whining. It just wasn't pretty. I was generally exhausted by the time we got out the door at 7:15 am. I will not miss that this year. Now they can sleep until 7:30 if they so choose and still be ready for our 8:00 am start time. We started our homeschooling year last Monday so that we can be done earlier in June. To everyone who has asked, I have told them that we survived the first week, which is an accurate assessment. This is new for all of us and we are still working out the kinks. The curriculum I chose is very writing intensive which isn't ideal for two young boys who hate writing, so I make sure that they do some writing every day and then we do the rest orally. I don't want them to hate all their subjects when what they really hate is the physical task of writing. They like to learn. They just don't like to write. I've requested some books from the library on teaching children to write. I'm hoping that will give me some good ideas. I also took my friend's advice and put up an incentive chart where they get a sticker for co-operating with their lessons for that day. I had done one for David last year when school had become a real struggle for him and it helped. It helped today as well. Hopefully, that will continue. We actually had a really good day today. We did about 1 1/2 hours of science which they both enjoy. We collected leaves from all the plants around our house and compared and sorted them and then did crayon rubbings of them. We also planted some apple seeds to see how many germinate. We also did our daily allotment of phonics, reading, math, and spelling, and went to our local library. We have a meeting with our homeschooling group on Friday and we start going to a co-op on Monday. I think that we are going to be OK. After all, I didn't learn how to be a mother in one day, or one week. In fact, I'm still learning with every new stage that comes along. This is just another one of those stages and I need to give myself (and them) time to learn. On a somewhat unrelated note, the public schools in my city have a mandatory uniform policy in place this year. Every school has its own colors. It was amazing to see all the schoolchildren looking alike! They did look very neat and clean. Hopefully, it will help eliminate some of the distractions in the classroom and lessen the gang activity in our schools. Over at Catholic Exchange today, there is a wonderful article by Amy Cara about her current pregnancy and trying to overcome her fear of what may be a difficult road ahead: Calming a Mother's Fear. I wanted to leave her a comment and let her know I was praying for her, but the comments don't seem to be working properly today. Won't you join me in saying a prayer for this mother and her unborn child?